I have been getting asked a lot recently about what essential oils can help with sugar cravings. I have some great tips for you for day to day help, and then I will give you some advice if you want to break that cycle you have with sugar!!! Did you know that refined sugar is actually addictive? According to Professor Hoebel of Princeton University, "sugar stimulates receptors to activate the same pathways that are stimulated directly by drugs such as heroin or morphine." The Journal of Psychoactive Drugs did a study titled 'Sugar Addiction,' in 2010. They stated in that study that sugar addiction follows the same pathways in the brain that a habit-forming drug does. Well, that sure helps explain why sugar addiction is so difficult to handle. It doesn't help that many of our bodies are overrun with yeast, candida, parasites which are all sugar loving and when you don't eat sugar your body can actually experience withdrawal symptoms. A simple tip that helps many people when they crave sugar is to grab their peppermint. A few tips I hear that work for people is to place a drop of peppermint under their tongues, or in some water. For me, I am all about convenience so I prefer having the peppermint beadlets handy and just popping one in my mouth. For some people, peppermint does not do the trick! Fennel has worked for many others. When they crave sugar they take a drop of fennel into their hand or finger and lick of off. Not sure why people apply it that way....again going to efficiency I might just place a drop on my tongue. Slim and sassy is a blend of Grapefruit, Lemon, Peppermint, Ginger, and Cinnamon. This blend can not only help by supporting a healthy metabolism it can also be helpful in fending off sugar cravings. Either placing a drop or two in some water and sipping on it when you have cravings, or if you always have sugar cravings at the same time of the day taking a softgel to help fight those cravings off. 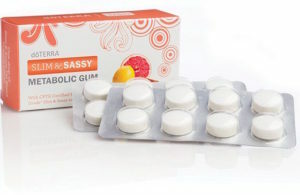 And again with efficiency.....I am a busy lady :) I prefer the brand new Slim & Sassy gum!!! Have a sugar craving? Pop a piece of gum in your mouth! How convenient is that! Click here to learn how you can use doTERRA's gentle 30 day cleanse to kill off yeast, candida, parasites and bad bacteria. I hope you enjoyed this tip! I would love to connect, email me at Jennifer@naturalwellness.tips if you would like to learn more.